How architecture will respond to the possibility of vertical connections for the new city? The building footprint of the Tribeca area is re-imagined and condensed to create much greater open spaces. The new spatial configuration on the macro scale can also have new implications on a micro scale, resulting in a new infrastructure system that is first imposed and then integrated the blocks. The result is the generation of new connections that propose a new kind of mobility on different levels. In order to further accentuate the free space at the level of the ground, most of the building blocks are elevated and suspended over a liberated space where circulation is unconstrained and open space is abundant. 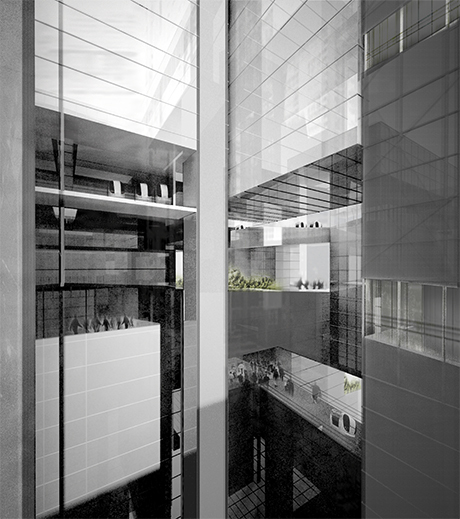 The blocks themselves are conceived as dense volumes anticipating a continuous growth in population in New York City. 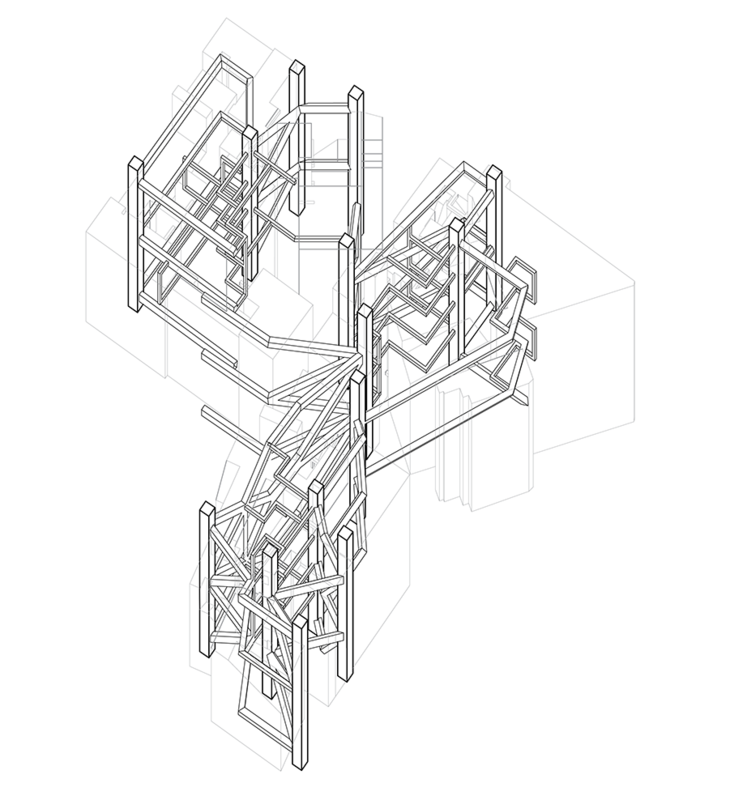 The current built city is defined vertically by an elevator connection to the building plinth. The base of the building is often used for an isolating program, such as parking, which leads to a disconnection between the street and upper levels of the building. 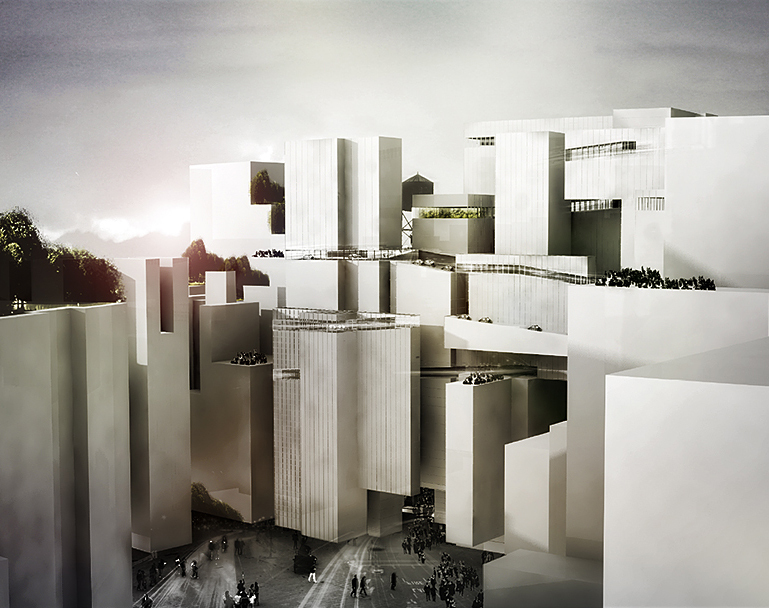 The project proposes instead a new porosity that allows for local interconnectivity. 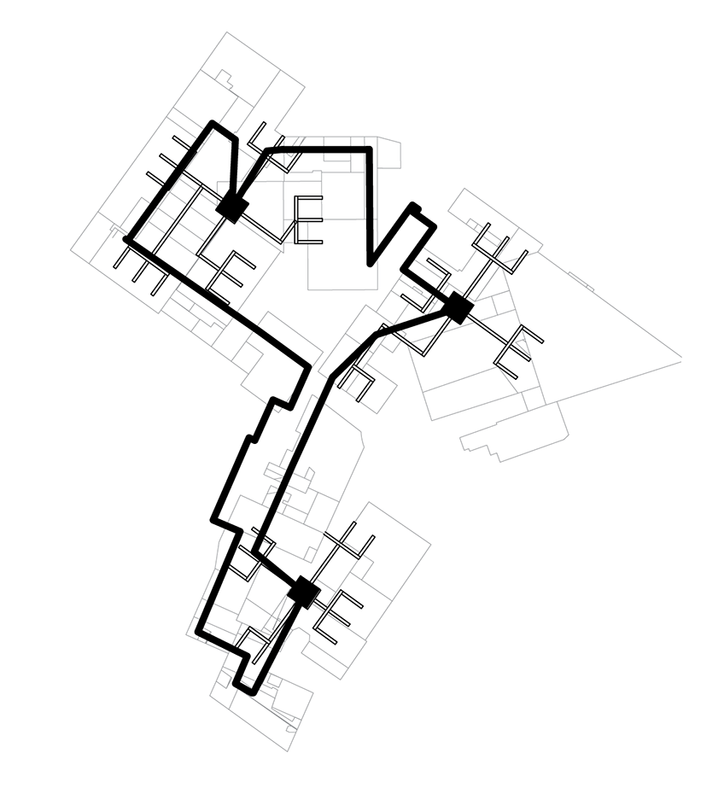 Lateral communication at multiple levels brings activity to spaces that were previously isolated. Vertical public transportation will significantly reduce the presence of the private car and parking lots, while increasing the freedom to independently go from one place to the other. The proposal aims to densify the connections within the block, through the concentration of events, mixed-use programs and the integrated public/private circulation. The system is composed by five main elements: the loop (primary transportation), elevators (secondary connections), the viaduct (commercial program activator), residential, and civil/manufacturing located at strategic points for accessibility. 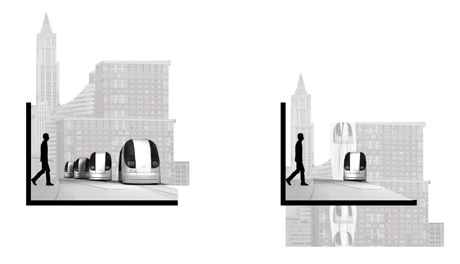 Pedestrian traffic and car traffic are now homogenous - a car sharing system acts as a new form of public transportation that ties together with the idea of the building not as individual units but a connected community. Cars are continuously present into the loop; they can be rented and returned depending from the needs. It is possible to move around the space at each level and then return the car in any other section of the loop. All the rooftops, now conceived as new layers of livable open space, are connected one to the other by a sloping viaduct. This system of roofs connects seamlessly from the ground up, making movement between elevated level and ground transportation an experience in itself. By rethinking circulation and movement in the city, new non-linear experiences can be created while at the same time creating alternative solutions for the car, thereby reducing traffic congestion, noise, and parking space. Instead, more attention can be focused on increasing open public space to the city and rethinking the ideas of urbanism.